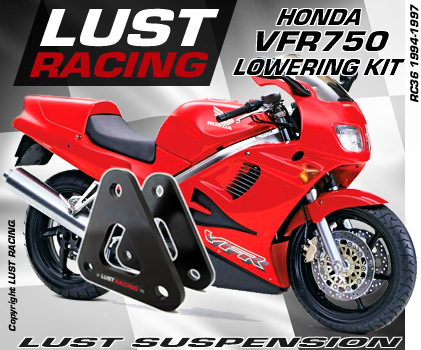 Lowering kits for Honda VFR750 year models 1994 to 1997. by LUST Racing. Reduces the seat height by lowering the rear suspension on the bike. The suspension is lowered by replacing the standard suspension linkage brackets with new lowering ones. LUST Racing suspension linkage brackets are made in roll forged steel and are stronger than the standard items replaced. The LUST Racing lowering kits for Honda VFR750 RC36 1994-1997 motorcycles comes with model specifi installation instructions in English. NOTE: WILL NOT FIT PRE 1994 VFR750 models! Looking for another VFR model? See our lowering kits for later VFR800 models on separate pages!